Our FREE ID service means embroidering a personal name and/or number on your gloves. Your own, your hero's, your pet's - it's your choice! This service is provided at no extra cost - it's completely FREE! Effectively do the job of a goalie whilst keeping your fingers protected when you pull on these Prisma RG Finger Support Goalkeeper Gloves in a Support Orange, Blue and Orange from Reusch. These Reusch goalkeeper gloves are designed with the RG, Resist Grip which provides a large soft surface area which cushions the impact of the ball which helps with keeping grip all year round, no matter the weather. This goalie glove also utilises an Expanse Cut which features enlarged seams which increases the inner palm surface. 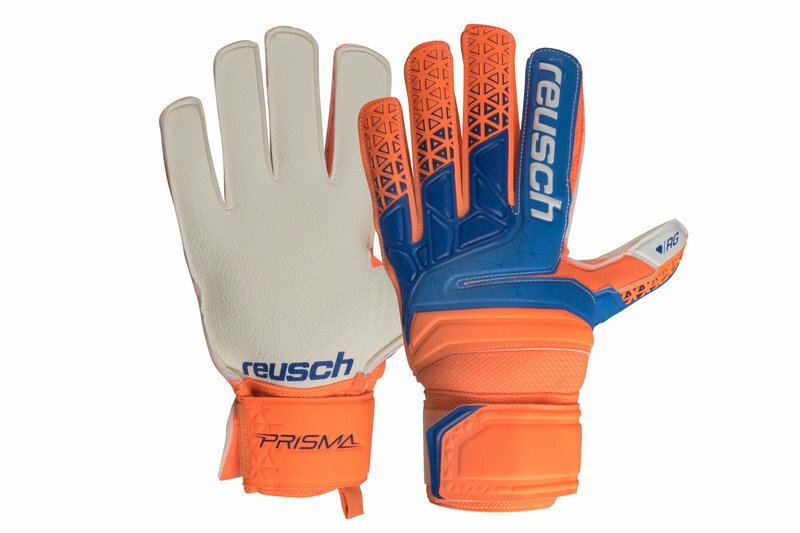 The Reusch Finger Support (Ortho Tec) technology keeps the fingers protected by offering ergonomically constructed inserts behind the fingers which mould to the shape of the hand/ fingers whilst offering excellent reinforcing, avoiding finger bend back. Striking in colour, the Prisma RG Finger Support Goalkeeper Gloves stand out on the pitch and help you raise the standard, whilst keeping those all-important clean sheets.